13 Parts of an airliner in 3-part cards, includes black-line master. 14 Parts of an airplane in 3-part cards, includes black-line Master. Describes 9 parts of an amoeba. 9 Parts of an amoeba in 3-part cards, includes black-line master. 10 Parts of an anchor in 3-part cards, includes black-line master. 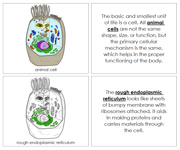 Describes 19 parts of an animal cell. 19 Parts of an animal cell in 3-part cards, includes black-line master. Describes 7 parts of an atom. 7 Parts of an atom in 3-part cards, includes black-line master. Describes 10 parts of a bacterial cell. 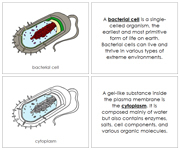 10 Parts of a bacterial cell in 3-part cards, includes black-line master. 17 Parts of a bagpipe in 3-part cards, includes black-line master.